The Norwegian Royal Court has confirmed that in addition to Johan Martin Ferner's widow Princess Astrid Mrs. Ferner, King Harald V, Queen Sonja, Crown Prince Haakon, Crown Princess Mette-Marit, Princess Märtha Louise and Ari Behn will all attend the funeral service, which will take place at Holmenkollen Chapel on Monday 2 February 2015. The late Johan Martin Ferner's nearest family is of course also expected to attend, in addition to other Ferner relatives. Some of the Lorentzens might fly in from Brazil. Erling Lorentzen, who celebrates his 92nd birthday today, seems to be in good shape for his age, but could still find the long flight too tiresome. The funeral will be a private affair without media presence. I doubt that there will be many, if any, members of foreign royal families present, as the historian Trond Norén Isaksen has also commented on in his blog article of Monday 26 January 2015. The funeral service for Princess Astrid's husband Johan Martin Ferner, who died on Saturday 24 January 2015, 87 years old, will take place at Holmenkollen Chapel on Monday 2 February 2015 (1 p.m.), the Norwegian Royal Court announced today. HM The King has decided that on the day the funeral service takes place, the flag will be flown at half mast from the Palace balcony. After the ceremony of sprinkling earth on the coffin has taken place, the flag will be hoisted to the top. It is still not known where Ferner will be interred. The Holmenkollen Chapel, which is situated in the Ris parish in Oslo, is close to the hearts of both the royal family and the Ferners. After the chapel burned down in 1992, Princess Astrid Mrs. Ferner was involved in the campaign for rebuilding it. Princess Astrid and Johan Martin's eldest son Alexander was married there in 1996. Holmenkollen Chapel is also the place where the royal family traditionally attends the service on Christmas Day. Johan Martin Ferner, husband of Princess Astrid Mrs. Ferner and brother-in-law of King Harald V of Norway, died early in the morning today, 24 January 2015, at Rikshospitalet (the National Hospital), Oslo, the Royal Court has announced. The time of death was stated as 05.25. Ferner was last seen in public at his youngest son's wedding in October 2014, and looked rather frail. In his condolences King Harald says that "It is with deep sadness that we have received the news that Johan Martin Ferner has passed away. Our thoughts go to Princess Astrid and her family, who have lost a wonderful husband, father, father-in-law and grandfather". Johan Martin was born at the Red Cross Clinic at Frogner in Oslo on 22 July 1927 as the youngest son and child of clothes shopkeeper Ferner Jacobsen (1885-1964), from Nøtterøy outside Tønsberg, and Ragnhild Ferner Jacobsen, née Olsen (1889-1966), who came from Tromøy, which today is a part of Arendal municipality. According to the midwife's birth report to the Oslo Health Council, Johan Martin was born at 9.30 in the evening with Ragna Huser as midwife. Johan Martin's siblings were Inger (1913-1972) and Finn-Christian Ferner (1920-2001). The grant published in Norsk Kundgjørelsestidende 25 November 1927 No. 295, p. 1. 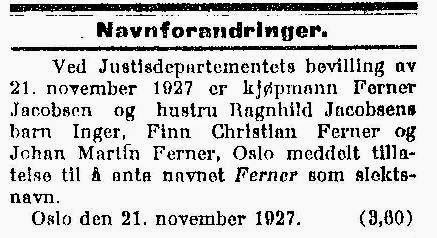 One could get the impression that the sons already had the name Ferner as their third given name, but only the names Johan Martin were registered at birth. After graduation from the private Vestheim (high) school at Frogner, Oslo in 1947, Ferner followed a course at Oslo Handelsgymnasium (Oslo Business College) before heading on to business studies at the London Polytechnic Institute, Bradford Technical College and the University of Lyon. He then worked at Harrods in London before returning to Oslo to work for his father's company clothers shop Ferner Jacobsen AS in Stortingsgata (Parliament Street). He worked his way up in the company before taking over the ranks together with his brother Finn-Christian in 1964. Johan Martin's youngest son Carl-Christian (b. 1972) is today the executive chairman of the board. Johan Martin Ferner was for many years an active yachtman and took a silver medal (Six Metre Class) in sailing at the Helsinki Olympics in 1952. In 1953 Johan Martin Ferner married Ingeborg Hesselberg-Meyer (1931-1997). The marriage ended in divorce in December 1956. Ferner and Princess Astrid had been part of the same social sircle since the early 1950s and after his divorce their friendship gradually developed into a relationship. King Olav finally gave in and gave consent to marriage and their engagement was announced on 13 November 1960. The wedding took place in Asker Church on 12 January 1961 (the mariage banns at Oslo domkirke (Oslo Cathedral) can be read here (no. 75)). The couple had 5 children: Cathrine, b. 1962, Benedikte, b. 1963, Alexander, b. 1965, Elisabeth, b. 1969 and Carl-Christian, b. 1972, and 5 grandchildren. The court has so far not informed about the funeral arrangements and where Johan Martin Ferner's last resting place will be. 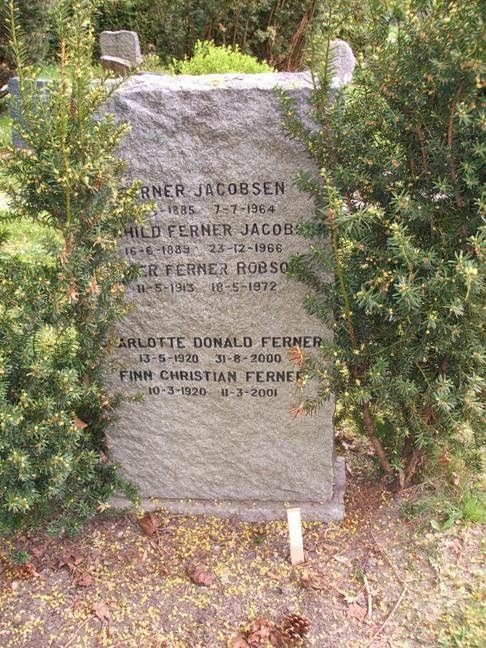 The Ferner family grave is at Vestre gravlund (Western Cemetery) in Oslo, but I would not be surprised if Ferner was interred at Ris Churchyard instead. Johan Martin Ferner and Princess Astrid have for many years lived at Gråkammen in Oslo in the parish of Ris (their former home at Vindern was also in the same parish). Princess Astrid's sister Princess Ragnhild is buried at Asker Cemetery. The Ferner family grave at Vestre gravlund (Western cemetery) in Oslo. Trond Norén Isaksen 24 January 2015: At the road's end: Johan Martin Ferner (1927-2015), businessman and royal husband. VG.no 24 January 2015: Prinsesse Astrids ektemann er død. Dagbladet.no 24 January 2015: Johan Martin Ferner er død and - Ferner har betydd veldig mye for bedriften. Aftenposten.no (NTB) 24 January 2015: Johan Martin Ferner døde natt til i dag. Kongehuset.no 24 January 2015: Johan Martin Ferner er død. (English version). 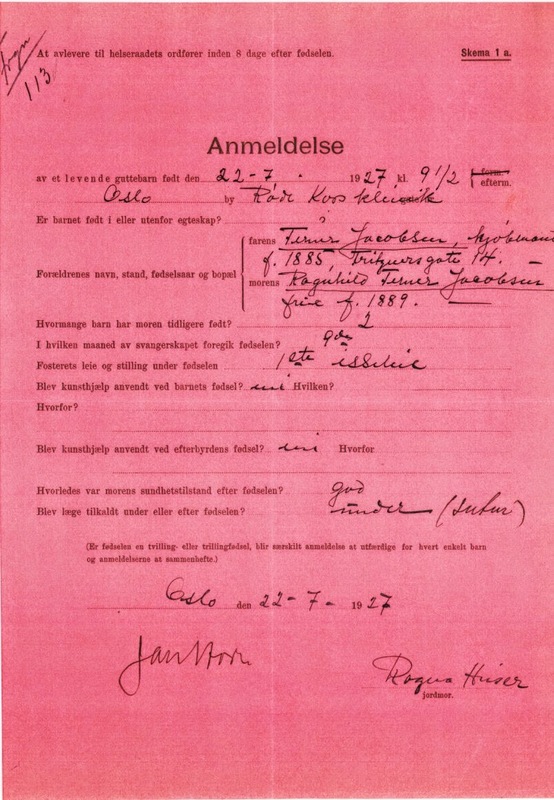 Oslo byarkiv (Oslo City Archives), birth report to Oslo Health Council. Aftenposten 20 July 1997 No. 328, p. 13. Updated on Saturday 24 January 2015 at 9 p.m. (last article was modified); Saturday 24 January 2015 at 9.10 p.m. (my translation of condolences replaced with the court's own version, link added); Monday 26 january 2015 at 09.35 (reference in image of name change byline corrected from "395" to "295"), Monday 26 January 2015 at 19.30 (typo corrected); Thursday 28 May 2015 at 21.55 (typo corrected). Kensington Palace opened earlier this week a Twitter account for the Duke and Duchess of Cambridge and Prince Harry of Wales, meant to cover their activities as well as updates on their Royal Foundation. The link to their Twitter account is https://twitter.com/KensingtonRoyal. Buckingham Palace's Twitter account can be found at https://twitter.com/BritishMonarchy, while the activities of the Prince of Wales and Duchess of Cornwall are covered by https://twitter.com/ClarenceHouse. The Duke of York is also on Twitter: https://twitter.com/TheDukeOfYork. Tweets sent by HRH himself is signed - AY. I doubt that the Duke and Duchess of Cambridge will tweet themselves, though. Updated on Friday 1 April 2016 at 09.00 (typo corrected).